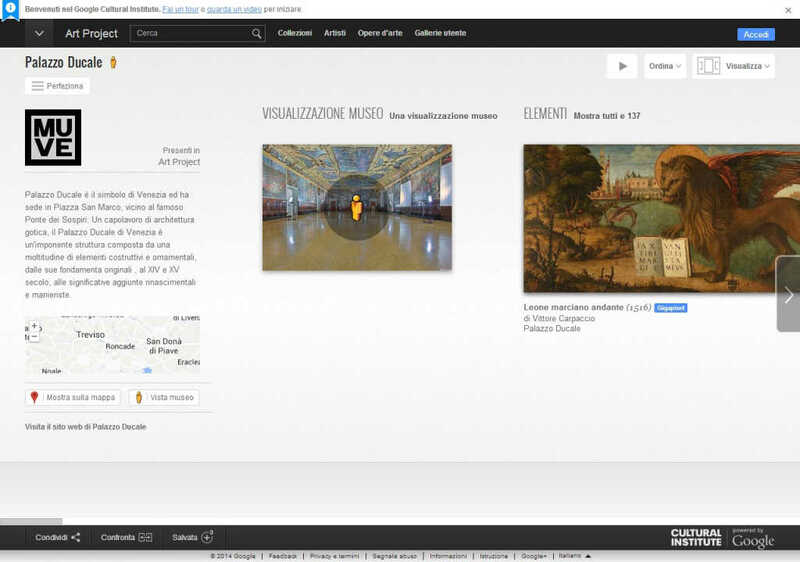 Thanks to the collaboration between the Fondazione Musei Civici di Venezia and the Google Cultural Institute, the Palazzo Ducale is part of Google Arts & Culture: an online platform through which the public around the world can access high-resolution images of works of art in the collections of museums partners in the initiative, with the goal of democratizing access to culture and to promote its preservation for future generations. For Palazzo Ducale are uploaded 137 high resolution images of some of the most representative works of the collection and the museum display. These masterpieces include the San Cristoforo by Tiziano, paintings by Paolo Veronese (Vecchio orientale e giovane donna, Giunone offre a Venezia il corno dogale, L’Apoteosi di Venezia) or the Nettuno offre a Venezia le ricchezze del mare by Giambattista Tiepolo as well as the Paradiso by Jacopo and Domenico Tintoretto. Not only! For Palazzo Ducale is now possible to visit the splendid museum interior with the Street View virtual tour, which allows you to appreciate the beauty of the exhibition itinerary, focusing on particular aspects or works, such as the “Leone marciano andante” by Carpaccio, exceptionally available in Gigapixel resolution. In fact each Gigapixel image contains around 7 billion pixels, and thus allows the viewer to appreciate the details of the stroke beyond what can be seen with the naked eye.